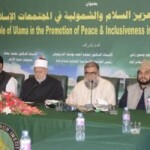 Islamic Research Institute (IRI) International Islamic University, Islamabad (IIUI) will establish a Paigham e Pakistan center for peace, reconciliation and reconstruction studies and will also offer a post graduate diploma in peace and conflict studies. 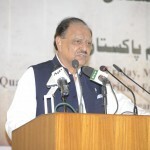 The proposal was recommended by academicians, researchers, policymakers, religious leaders, parliamentarians and prominent figures of society in a consultative meeting organized by Islamic Research Institute for a comprehensive plan of action for Reconstruction of an inclusive Islamic Society in Pakistan in the light of Paigham e Pakistan at Faisal Masjid campus. 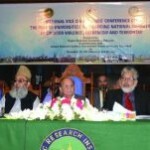 The meeting recommended that the diploma would be jointly offered by IRI, HEC, and Council of Islamic Ideology. The meeting also discussed certificate courses and curriculum development for a three credit general course on peace and conflict studies. The members of the group also exchanged views on the book proposals such as publication of Paigham e Pakistan in different languages, and thematic volume in reconstruction of an inclusive Pakistani Islamic society. IRI, on the same day arranged a parallel working group meeting on outreach-training programs-conferences and seminars publicity, promotion and propagation of Paigham e Pakistan. It also approved national conference on interfaith harmony and co-existence, international conference on Muftis of Muslim world and representatives of Islamic organization on Paigham e Pakistan. The meeting discussed development of website on Paigham e Pakistan. The meeting members also agreed that TV talk shows, PTV documentary, short video clips and strategies for promotion of Paigham e Pakistan in Print , electronic and social media will be arranged. Dr. Qibla Ayaz, Chairman Council of Islamic Ideology was the chief guest of the meeting who provided a glimpse of the Paigham e Pakistan activities. 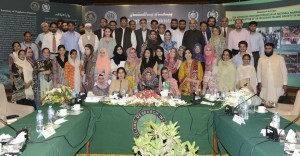 He lauded IIUI services and also discussed various salient recommendations of Paigham e Pakistan. It was also attended by Ms. Perveen Qadir Agha as guest of honour who discussed education system in the country and urged that prime focus must be syllabus. She also maintained that role of media was vital to make an understanding of the narrative of Paigham e Pakistan. Dr. Masoom Yasinzai , Rector IIUI addressing the meeting said that relevancy to the needs of the society must be top priority of the educational institutions. 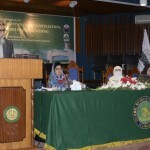 He told that IIUI is being hailed for its Paigham e Pakistan initiative and key leaders of various Islamic countries have started mulling over establishing International Islamic Universities after observing the role of IIUI in solutions of the issues of society. Dr. Masoom said Paigham e Pakistan is the actual image and version of the Pakistani society.